Just ahead of the weekend Nvidia posted a Q&A session hosted by Andrew Edelsten, the firm's Technical Director of Deep Learning. As more games become available featuring this new kind of image smoothing technology, numerous PC gamers and enthusiasts have been struck by how DLSS behaves differently to previous anti aliasing tech they have experienced. Of course DLSS is very different, as for the first time such a technology uses AI and deep learning to deliver smoother visuals, and higher frame rates in graphically intensive games. Edelsten explains that "the DLSS team first extracts many aliased frames from the target game, and then for each one we generate a matching 'perfect frame' using either super-sampling or accumulation rendering." Later the Nvidia supercomputer trains the DLSS model to recognise the input frames and generate high quality anti-aliased images that match the 'perfect frame' as closely as possible. Subsequently the process is repeated with the model trained "to generate additional pixels rather than applying AA". Due to the above training requirements DLSS is beneficial only in resolutions it has trained in. However, training is ongoing and Nvidia says that "our supercomputer never sleeps, and we continue to train and improve our deep learning neural network even after a game's launch". An additional consideration is that games that run at lower frame rates (proportionally less fixed workload) or higher resolutions (greater pixel shading savings), benefit more from DLSS as DLSS required a fixed amount of GPU time per frame to run the deep neural network. DLSS is only applied where a performance gain will be delivered and thus isn't applied in games running at high frame rates or low resolutions. So far Nvidia has concentrated on DLSS at the higher gaming resolutions such as 4K, as explained above, but due to community feedback it will now focus training time on lower resolutions "as a top priority". Nvidia doesn't see DLSS as the only solution, and admits that TAA can be preferable depending on game implementation, resolution, and quality settings. Rounding off its Q&A session Nvidia talked about specific DLSS changes in recent updates to Battlefield V and Metro Exodus, so if you play either of those game or wish to in the near future (on an RTX 20 graphics card) it will be worth a read. In brief, as indicated in the paragraph above, Nvidia is pushing its training efforts to improve image quality at 1080p in BFV. It will also train for ultrawide monitors (e.g. 3440x1440) in this game. 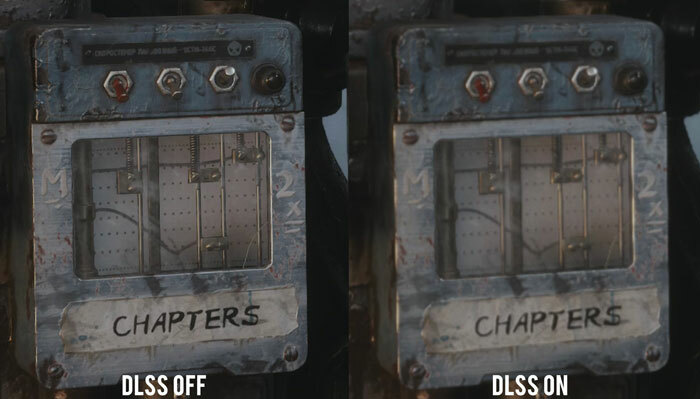 Meanwhile, Metro Exodus DLSS is being improved to provide better sharpness and image quality across all resolutions. I had a good read of that on Saturday, very happy to see they're officially supporting ultrawides. I'm looking forward to seeing the improvements they make. I too enjoy smudgy messes in my vidya games. What else is AI? They tell it how certain thing interact and it's up to the AI to come up with the ‘best’ solution based on the multitude of factors which it faces in any given situation. That is the definition of AI. How do you think your brain works? It just doesn't require the first step, being told how things interact, as we have other way and means of determining that part of the equation. Although to some extent we are informed by others which we then incorporate into our own experience, and thus develop our own ‘solutions’. Hardware unboxed made a video where they show that DLSS at the moment is utterly horse manure.